Are You at Risk for C. Diff? C. diff is a bacterium that can cause mild diarrhea to life-threatening bowel disease. The risk of acquiring C. diff. increases with age, the use of antibiotics and time spent in hospitals or in nursing homes. Volunteers are needed for research study being conducted to evaluate the effects of an investigational vaccine for C.diff infections. You may qualify if you are 50 years old or older, are planning a hospitalization, and/or have had at least 2 recent hospital stays within the past year. Call 1-727-347-8839 (USA) for more information. 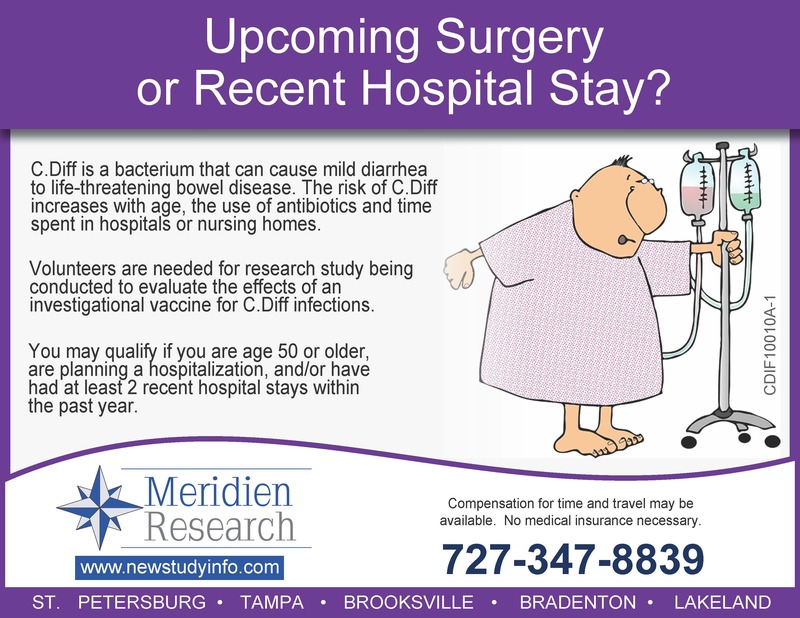 Meridien Research provides patients and families in the Tampa Bay area an opportunity to take part in clinical research trials for a wide variety of medical conditions. These research trials are usually offered at University or large research institutions, but with offices in Tampa, St. Petersburg, Brooksville, Bradenton and Lakeland, area residents can have access to the latest in medical research without leaving home. This entry was posted in Clinical Trials and tagged C. diff research and development, C. diff. prevention, C. difficile clinical trials, C. difficile prevention, Meridien Research, Sanofi Pasteur on June 20, 2014 by cdifffoundation.